Adjustable length, approx 26" to 28"
As the saying goes, there are plenty mermaids in the sea. Sorry? Fish? No, we're positive that's not how the saying goes. It's all about the mermaids (it's always about the mermaids). They've got fantastic glittery tails, long waving locks, killer singing voices, and usually some pretty fancy fish friends. As fantasy creatures go, they're pretty elegant. As a matter of fact, we're pretty sure they're aquatic royalty. Who else could defend the deep and look fantastically fanciful while doing it? And where would oceanic royalty be without some wondrous adornments? Here is our Mermaid Necklace. 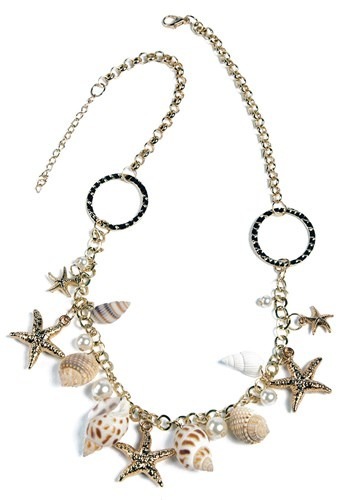 It's a gold colored necklace affixed with charms that look like sea shells, star fish, and pearls. It's even adjustable. Can you imagine how regal you would look as a mermaid with this fancy thing draped around your neck? We can. You would be o-fish-ally stunning.